6 miles out and back. Moderate to Strenuous. Approximate time: 4-6 hours. 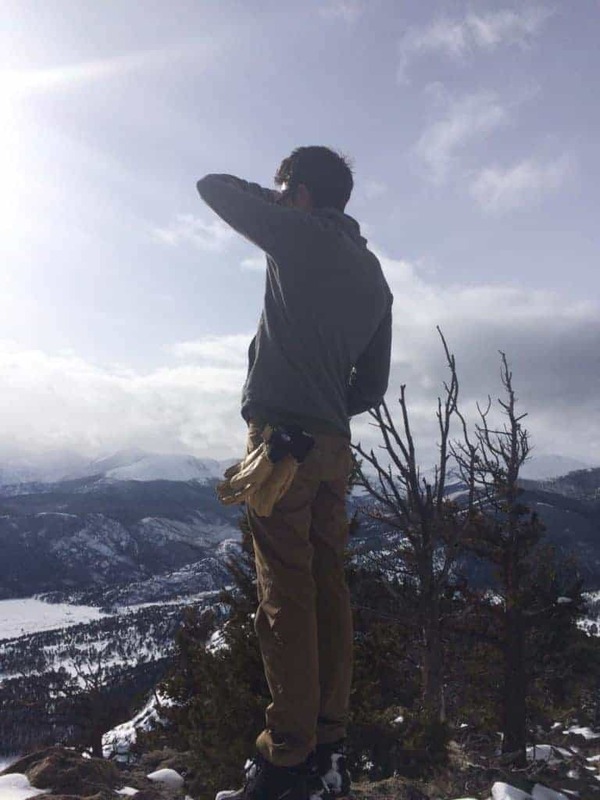 If you’re up for a longer adventure, check out Deer Mountain. This out-and-back trail winds its way up through beautiful pine forests that open up in places to give you spectacular views of the majestic peaks in the distance. The incline is challenging, but definitely doable with snowshoes on. It gets a little steeper on the last push to the summit, but this part is pretty short. Plus, you’ll be rewarded at the top by breathtaking 360′ views of the park. You’ll look down on alpine lakes and and up at towering Longs Peak on the horizon. Plus, it’s very likely that you’ll have the entire summit to yourself. We did, even on a weekend! Make sure to dress in layers and pack plenty of water and snacks, as this hike will likely take you several hours to complete. The trailhead can be accessed through either the Beaver Meadows or Fall River entrances, and it is located right at the intersection of Highway 36 and Highway 34. It’s one of the fastest and easiest trailheads to get to in the park! 5.7 miles out and back. Moderate. Approximate time: 3-5 hours. I personally think that all hiking in the snow is pretty magical, but this trail is especially wondrous. You’ll begin by climbing gently, passing the frozen 30-foot high Alberta Falls about a mile into your hike. The trail becomes steeper as you get closer to the lake, but you’ll be distracted by incredible scenery. Before reaching the lake, you’ll hike through a breathtakingly beautiful and dramatic gorge, with steep walls of colorful rocks towering above you on either side. The trail ends at a pristine alpine lake (Loch Vale), which will sparkle in all of its frozen, peaceful beauty. For those seeking a bonus adventure, you can tack on an extra hike to Mills Lake, Black Lake, or Lake Haiyaha by following the signs at a junction about two miles from the trailhead. The hike begins at the Glacier Gorge trailhead, which can be easily accessed from either the Beaver Meadows or Fall River entrance. 3.5 miles out and back. Moderate. Approximate time: 2-4 hours. There are a LOT of lake hikes that begin at the Bear Lake Trailhead. You can (and should) check them all out during the winter months when you don’t have to mess with the parking headaches, the shuttle (because you couldn’t find parking), and the crowds. 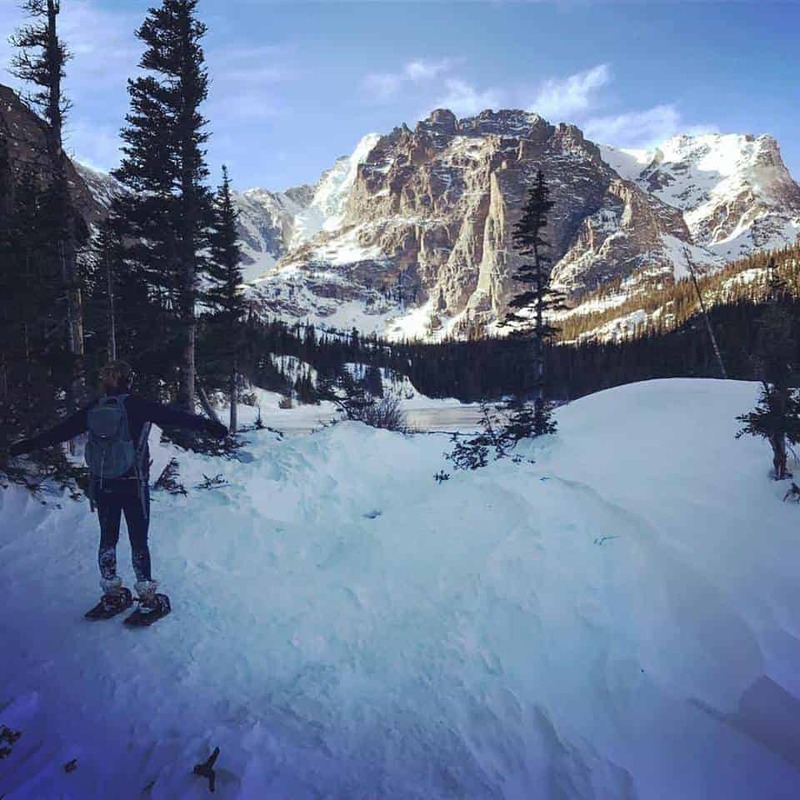 The other Bear Lake trails that make great snowshoe hikes include Bear Lake (0.8 miles), Lake Helene (6.5 miles), and Bierstadt Lake (4.4 miles). I’m highlighting the Emerald Lake hike because it packs in not one, not two, but FOUR incredible lakes in a relatively short distance. Do you have someone in your life that says hiking is “boring”? This is the perfect trail to take that special someone on, and then gloat all the way home when they realize you’ve proven them wrong. The trail starts at Bear Lake, then climbs up to the lovely Nymph Lake. After that, you’ll hug the shore of Nymph Lake before a short, steepish climb brings you to Dream Lake. One more climb brings you up to the gorgeous Emerald Lake, a satisfying reward to the rather steep section at the finish. To access the Bear Lake trail system, enter though the Beaver Meadows or Fall River entrance and take Highway 36 to Bear Lake Road. 0.9 mile loop. Easy. Approximate time: 1 hour. For those looking for a more mellow snowshoe hike, Sprague Lake is a fantastic option. This short, flat loop offers stunning views of the Continental Divide and the large lake itself. This hike really emphasizes the vast expansiveness of the wilderness that is Rocky Mountain National Park. The wide open views grant a wonderful sense of perspective, making the hiker feel small in the best possible way. Due to its easy accessibility, this trail is out of the question in the summer months if you don’t want to face hoards of loudly-talking, jean-wearing tourists. In the winter, however, you’ll experience peace and relative solitude. This hike is lovely on its own, or as a warm-up or bonus-lap to another adventure. The Sprague Lake trailhead is also located on Bear Lake Road, about five or six miles from the turn-off on Highway 36. 6.5 miles out and back. Moderate. Approximate time: 4-5 hours. This is a beautiful, varied hike that leads you though pine forests, past an old mine, and up to breathtaking views at the top of the cone. The trail starts by climbing at a moderate grade, then meandering through the forest on rolling hills. You’ll pass through a lovely clearing, and then up to excellent views of Long’s Peak. The final mile or so of the hike is pretty steep and rocky, but the views at the top are worth it. The summit boasts the kind of high mountain views that are typical of a fourteener, and we had it all to ourselves on a weekend! Be prepared to take off your snowshoes for the final climb. It’s ideal to have a way to strap them to your pack so your hands are free. To access the Estes Cone trail, enter the park through the Long’s Peak trailhead and look for signs at trail junctions that will guide you in the right direction. 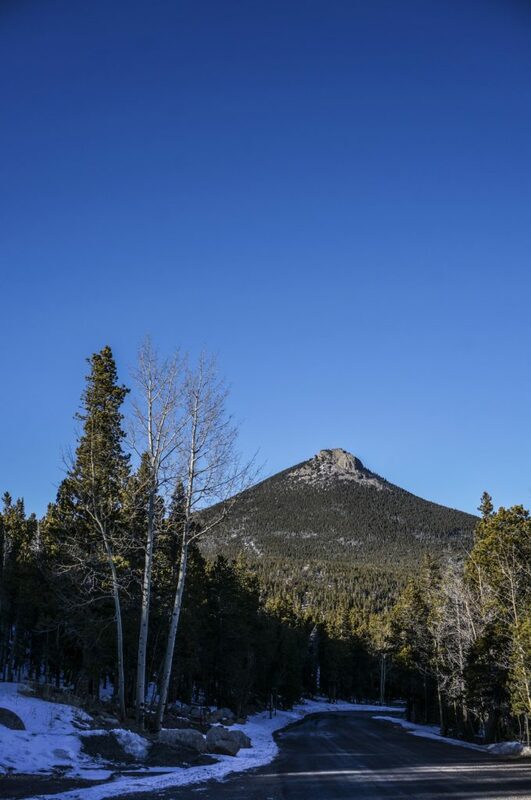 The Estes Cone hike will take you to the top of this beauty! Approximate time and distance varies. Out-and-back. Moderate. For those who aren’t familiar, Trail Ridge Road is the highest continuously paved road in North America, and it runs East-West across the length of RMNP. It’s typically closed to cars from October to May, due to heavy snow cover. While this might be a loss for drivers, it is a big win for snowshoers! 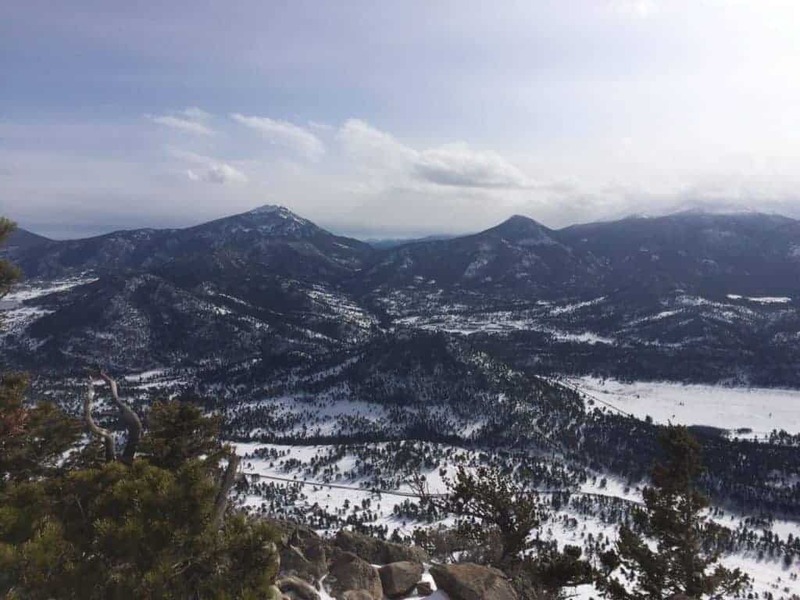 To experience this awesome hike, simply follow Highway 34 into the park (via the Beaver Meadows entrance) until it reaches the base of Trail Ridge Road. The road will be closed at this point. From there, park your car and start walking! You can go as far as you’d like, keeping in mind the time and energy you’ll need to make the return trip. The road can also be reached from a snowshoe trail that starts in the former Hidden Valley ski area. If you’d like to access the hike from Hidden Valley, follow Highway 34 towards Trail Ridge Road. The parking lot will be close to the base of Trail Ridge Road. There are also restrooms and a warming hut at this location. Icicle magic along the trail. Avalanche Safety: This is important. 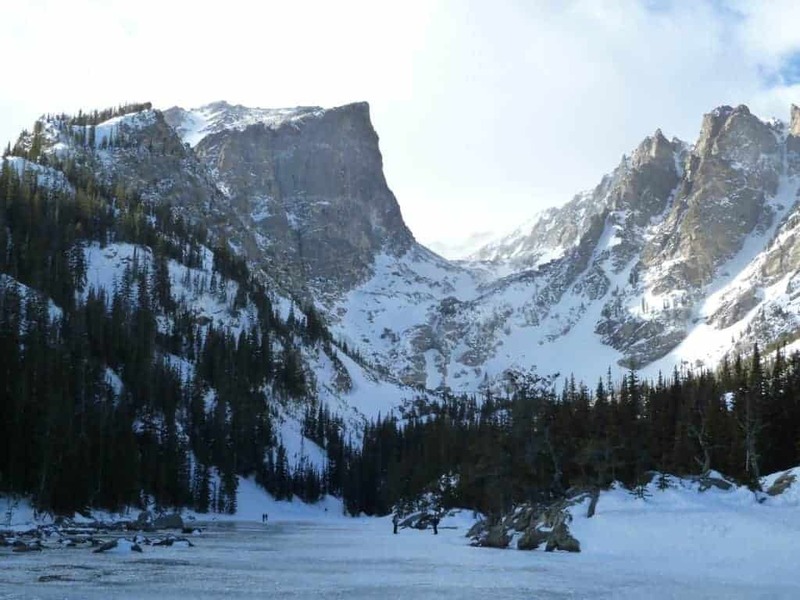 Many of the trails in Rocky Mountain National Park take you into the backcountry where avalanche danger may be higher. 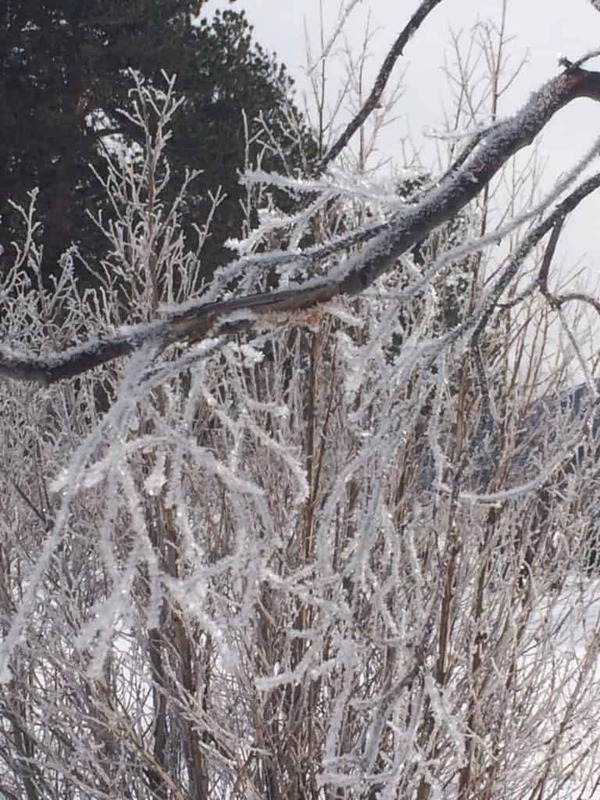 Make sure to check the Colorado Avalanche Information Center’s website , call the ranger station (970-586-1206), and/or stop by the visitor’s center to get information on the latest conditions. Time: Keep in mind that it typically takes longer to cover a certain distance on snowshoes than it would hiking. Adjust your distances, expectations, and start times accordingly. Navigation: Most of the trails described above are likely to be well-traveled, and you should be able to follow the footsteps of fellow hikers to navigate. That being said, way-finding in the snow can be challenging, and trail conditions can change quickly. Make sure to pay close attention that you are following the right tracks, as it’s easy to follow someone’s random detour without realizing it. Also, bring a map or-even better-bring your phone to navigate using GPS. Check out our tips for navigation in this post. (This post discusses navigation along the TMB, but the same principles can be applied to any trail). Finally, new snow can rapidly cover your tracks and make it very difficult to find your way back to your car, so make sure to watch the weather closely and turn around if you’re in doubt. What to Pack: Check out our Snowshoeing Packing List for a complete list of essentials. 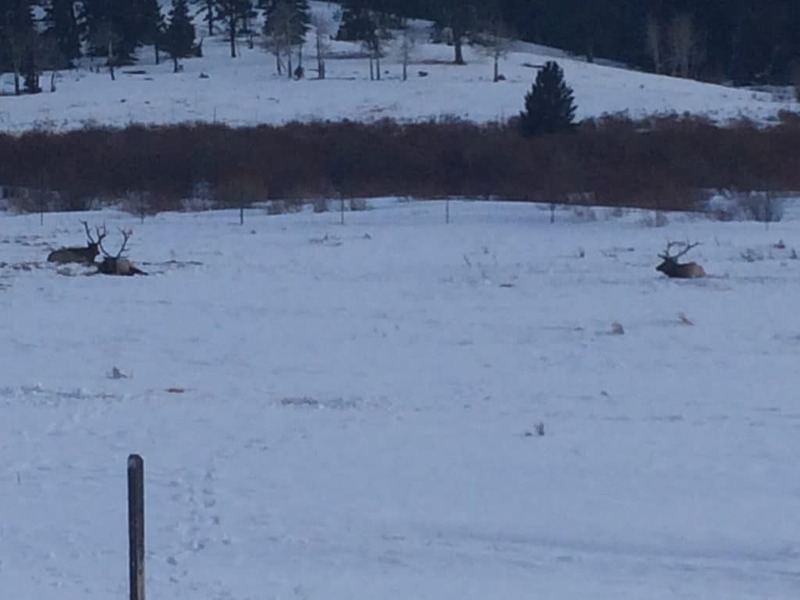 Elk enjoying a cold winter’s day.